In today’s episode, Amy and Emily are joined by Becky Yackley at the Aguila Ammunition booth during SHOT Show 2019. Becky returns to the show to fill us in on balancing life as a mom and competition shooter. The girls talk about the new STI Staccato line and why it could be the right firearm for you. Becky also shares her tips on choosing a concealed carry gun. Thank you to Aguila Ammunition for sponsoring this episode. Your guns are hungry. They crave lead and feast on recoil. They’re born with a glutenous appetite for speed and accuracy. We are Aguila Ammunition. We believe that getting the most out of your firearm begins with what you put into your firearm. And that’s why we only source the best raw materials to manufacture the best ammunition possible. Ammunition that’s reliable, dependable shot after shot. Ammunition that holds nothing back when it comes to performance, quality and innovation. Yes, ammunition that your guns with downright devour. Let the feeding frenzy begin. 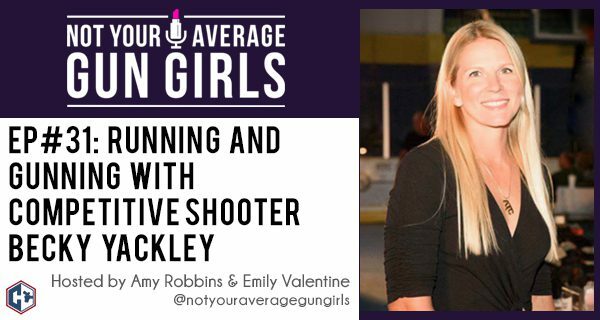 In this week’s episode, Amy and Emily chat with competitive shooter and Women’s Outdoor News writer, Becky Yackley. Becky updates the girls on her latest competition and advice she has for shooters that want to get into competition shooting. The girls also talk about running and working out while carrying a firearm. Finally, Becky and Emily also talk about the trailer that was just released for Love at First Shot Season 5 and their experience of being on the show. Style Me Tactical, a lifestyle blog sharing concealed carry tips, outfits, and preparedness advice. Alexo Athletica, the first active carry wear line on the market keeping women safe and stylish. Episode 50: It Can Happen To You. Are You Prepared?